CakeSpy Note: This is a totally sweet guest post from Singapore-based Cake Gumshoe Victoria, who blogs here. Honeycomb; noun: A wax structure made by bees featuring hexagonal cells where they store eggs and honey. 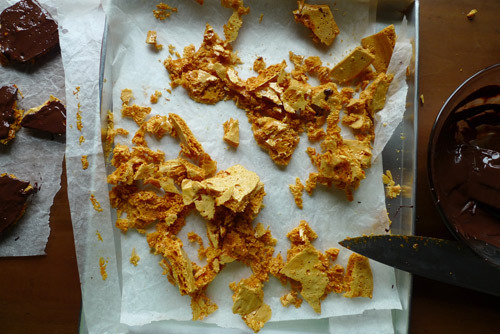 Honeycomb; delicious: An amalgamation of honey, sugar and glucose lifted to bubbly heights with the addition of baking soda. Promises to melt into almost nothing when you crunch into it. Much better and made even better when coated in dark chocolate. It’s like a whole fleet of honeycomb pieces entering a diving competition. My first encounter with the confection was when my sister introduced me to Violent Crumble; similar to Crunchie. It was strange, like cotton candy, it looked so large yet dwindled into sugar sweet nothing in your mouth with only an aftertaste of honey lingering. I’m not even sure it was real honey now that I think of it. 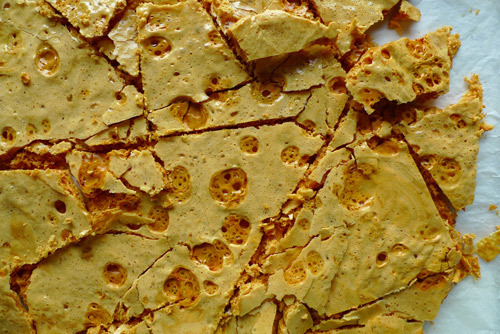 Their ‘pores’ were uniform, definitely not hexagonal and much smaller than the ones found in homemade honeycomb. I wonder how they did it. So today I decided I’d try my hand at making my own. 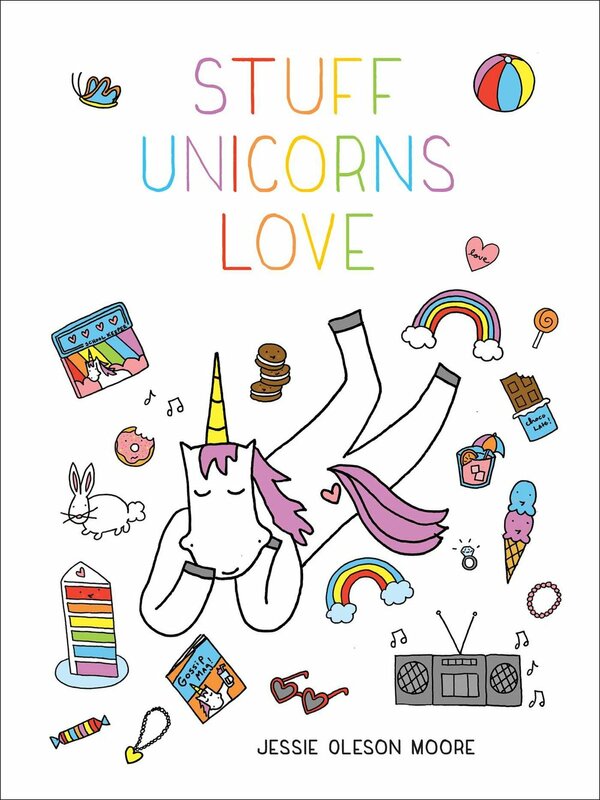 It’s simple enough, starring only a few main characters; sugar, honey, glucose and baking soda. It starts with a big pot, a minor effort of stirring and a huge uproar of sugar-ness rising once the baking soda comes into contact with the hot caramel-like liquid. It’s pretty fun to watch, like a school volcano project, only this time, completely edible. They’re great covered in dark chocolate, or if you’re feeling quite hardworking, bake a batch of cupcakes and use these babies as their crowning glory. Line a large baking tray with parchment paper and grease lightly with the oil. Place the sugar, honey and glucose in a large pot. Add 4 tablespoons of water and bring to a boil over high heat. Stir until the sugar dissolves and stay away once it does; just let it boil in peace. Simmer, without stirring, for 5-10 minutes or until it reaches 149°C (300°F). Immediately remove from heat and quickly whisk in the baking soda. The mixture will grow very quickly. Pour into the prepared baking tray, swirling to spread the mixture evenly. Leave to cool completely before breaking into chunks and shards. Store in an airtight container. 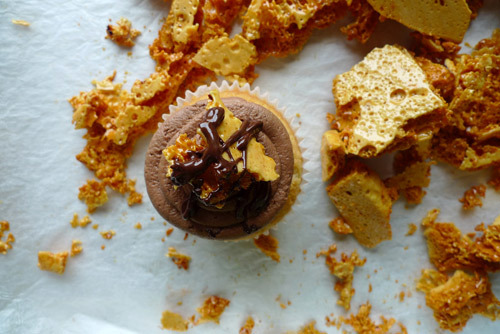 For chocolate coated honeycomb chunks, melt 150g of chocolate in the microwave and then after it’s cooled down, spread it evenly with a spatula over the honeycomb pieces or just let them plunge into chocolate heaven. Leave to set completely on baking paper. For more great recipes, visit Victoria's blog!